We recently spoke to a highly reputable and significant player in the insurance building industry, whose own company had recently inspected close to 1500 properties in Sydney after the heavy rain events experienced up north of late. We were interested to find out how many of the resulting Home & Contents type claims that they were inspecting were actually due to storm damage (i.e. roof sheet blown off, tree falls on roof etc) verses non-compliant roof plumbing workmanship. You might be astonished that the builder did not hesitate in his estimate that 90% of the wet buildings they had inspected were ultimately due to underlying poor plumbing and building workmanship. The current and now well embedded Australian trend in favour of contemporary design for new homes and commercial buildings has resulted in the building industry adopting heavy usage of low pitch metal deck roofs with internal box gutters. If installed correctly, this is a perfectly reasonable choice, however, this style of metal roofing, unlike traditional pitched roof methods, is very unforgiving if the design and installation method is not absolutely spot on. Australia would be considered world-leading in its Building Code regulations which are highly prescriptive in relation to the design and installation of metal roofing materials. However, unfortunately, due to the self-certification system for licensed Victorian plumbers and the VBA’s current requirement for only 2% of all Plumbing Compliance Certificates to be audited, vast amounts of non-compliant roofing go unnoticed until such time as heavy rainfall descends from on high! Panicked consumers then call their own insurance company who will (hopefully!) attend to the resultant damage while often completely overlooking the underlying cause of the water ingress in the first place. In some cases though the Property Owners are warned that any future claims for water ingress will be rejected on the basis that faulty roof plumbing (whether materials and/or workmanship) has been identified as the underlying cause of the claim. Metropolis is however receiving regular reports that a substantial number of these claims are now being completely denied by Home & Contents insurers, leaving consumers to fend for themselves and pay their own repair bills at a time of great distress. Stormwater roofing catchment systems are no different to nature’s own incredible water catchment systems. Creeks turn into streams which become rivers. Rivers run through mountain gorges and valleys and out onto alluvial plains, eventually passing through river deltas in the ultimate journey to the ocean. On each step of the journey, the system gets bigger and bigger. Likewise, your roof is intended to collect stormwater in small streams of either roof sheet corrugations or metal deck pans and direct these many small streams of water to a series of gutters (whether box gutters or eaves gutters). 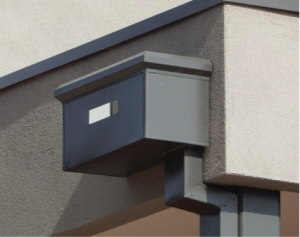 These gutter systems should then serve to direct water to downpipes, rainheads and/or sumps, which in turn feed to the belowground stormwater system and eventually to the Legal Point of Discharge for the property. All this should happen without the Property Owner giving any second thought to it other than perhaps enjoying the sound of rain on a metal roof! Just like in Nature, all is fine and well with most roofs during benign weather conditions. However, when heavy rain / hail / strong wind strikes, or when debris such as a wind-blown stray plastic bag, a dump of falling leaves, or a birds nest turns up in the wrong place, catastrophic flooding to a building can commence in a matter of minutes. The design Codes factor in all degrees of severity of rain events and build in overflow measures with the sole purpose of directing overflowing water (due to blockage or extreme rain event) externally to the building rather than into the building itself. Regardless of whether you have or haven’t carried out regular maintenance to your downpipes / rainheads / eaves gutters / box gutters, any overflow of water should occur outside, not inside, the building. Therefore, if water has entered your building, your roof is most likely not compliant in relation to overflow provision, if not also non-compliant in many other aspects as well. 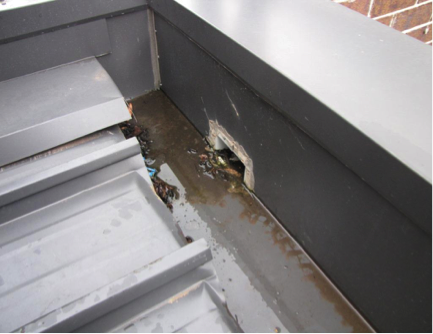 Images: (Left) a very common but non-compliant side discharge box gutter often seen on residential developments. (Right) an extremely common, non-compliant rainhead; these can have holes or slots or no openings at all – none are compliant with the mandatory standard AS3500. In Victoria licensed plumbers are required to carry out and certify metal roof plumbing in accordance with Australian Standards. If they fail in this responsibility there is potential to claim for associated costs against the plumber’s own workmanship warranty insurance policy. Such a claim can recover 100% of the costs to make the workmanship compliant and also to pay compensation to the owner for the cost of repairs resulting from damage to the building and contents. If you suspect problems, contact us today for an independent roof plumbing health check on your property – Metropolis is your plumbing expert for achieving roof plumbing compliance.